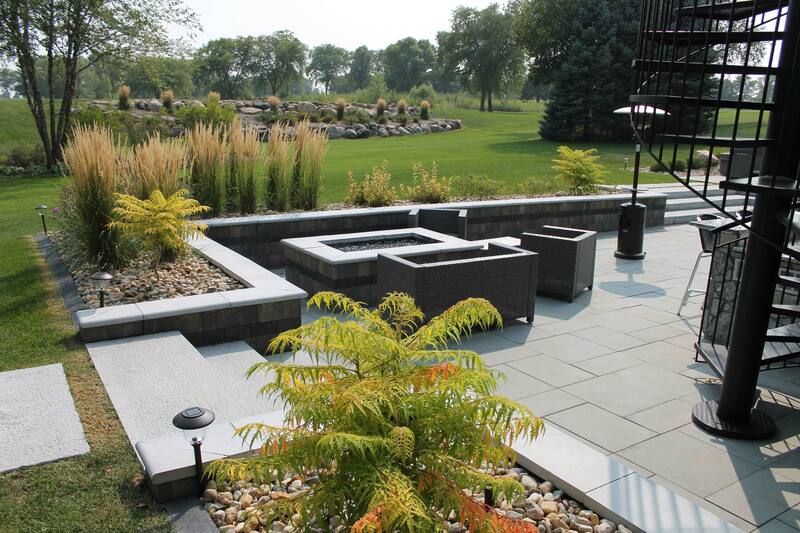 We had a lot of fun designing this contemporary landscape which gave us the opportunity to try some new things! First, our designer started with an inventory of the existing landscape; what should be kept, what should be changed, and of course, what needed to be included in the redesigned space. The second step of the process is the design phase. The space is analyzed, including the connection from the home and other access points, views from the interior and exterior, and the elevation changes. An estimate is created during this phase with the budget being at the forefront. Revisions are often made during this phase. The third step of the process includes product and plant selection as well as organizing the subcontractors, ordering the materials, applying for permits, and calling in the utility locates. Finally, installation begins! Sometimes revisions happen during this step too! On this project we discovered a water issue once we dug into the existing landscape. Because of this we tiled as needed and made sure we installed the proper drains. Unwanted water is a landscape’s worst enemy! We used Stonegate Country Manor in contemporary walls, Series 3000 for the wall accent, Ledgestone steps, and Torino pavers. The large format pavers simplify the patio and are carried throughout the contemporary design. Because the previous deck steps took up so much room, we installed a spiral staircase to provide more usable space. Landscape lighting extends the time the homeowner can enjoy their backyard and increases the safety factor. This large contemporary patio provides lots of space for family and friends! Great landscapes start in the design phase! Large planting masses make for easier maintenance.